SYNOPSIS OF ARTICLE: Is our personality pattern or type due to our genetics? Or is it a result of our environmental experience? This is the seemingly endless dilemma of nature verses nurture in determining our personality pattern. Here I show how our personality pattern is indeed both embedded in our genetics or temperament and our environmental experience. Originally presented at the International Enneagram Conference, Chicago, 1996. Published in Enneagram Applications, Clarence Thompson and Thomas Condon Eds. 2006. Updated 2011. Newcomers to the Enneagram are often curious about the “nature or nurture” origin of a personality style. Are we born with our style or do we develop it in childhood? Is your Enneagram style “caused” by one or the other? Or is a result of both, with nature responding to the nurture it’s experiencing? We know from our experience that nurture is powerful, but genetics and our biology are too. In this short paper I bolster the case for the interaction of nature with nurture, and focus much on nurture’s role in development, as we surely have a conscious and impactful hand in that, while “nature,” is to some extent fairly unchangeable, as research is now demonstrating. Herein I present the quite amazing discovery of nine recognizable and recurring temperaments in infants reported by Drs. Alexander Thomas and Stella Chess in their 1977 book Temperament and Development. How do we become our Enneagram type? Is it in our nature (heredity/constitutional factors, which form a temperament) or nurture (environment)? The answers to this question contain huge implications for parenting, education, and healthy development in general. Modern behavioral genetics, the study of the relationship between heredity and environment, and developmental psychology shed considerable light on the matter of nature and nurture. Studies repeatedly demonstrate that personality is largely the result of both heredity (temperament firstly) and what is called “the non-shared family environment.” Non-shared family environment means each child in a family experiences a different microenvironment. He or she perceives the “same” environment differently. The family as a singular influence is simply myth. The family does not offer the same environment to each child. It consists of as many microenvironments as there are children. I believe that what the behavioral geneticists call inherited temperament traits or inborn propensities combines with our emotional-environmental experience, that starts at conception (and includes inter-utero experiences) to determine our personality pattern, but more importantly, how it evolves (developmentally healthfully or not) across childhood. This results in development of an attentional style or habit of attention based upon early organization of information and energy into patterns of mind that we subsequently identify as types. These styles constitute the lenses or filters with which we view or perceive the world, literally from conception not birth, what technically can be called the primary orientation bias in the way a young child views or experiences the world. I call this early organization of attention and energy the molecular level of the way we organize the world with our bodies, hearts and minds. For instance, observations on neonates show differences in activity and reactivity from day one. As children we experience the environment differently, depending upon the way attention and energy get organized. And we are largely non-conscious of these early patterns in the interweaving of the flow of information and energy, our ways of organizing attention, until we develop our self-observer or inner witness. Furthermore, these perceptual or attentional style differences likely account for many of the ways parents and others respond to and nurture children. While preparing a paper on “The Childhood Origins of Enneagram Types,” I came across the work of Drs. Alexander Thomas and Stella Chess, reported in their book, Temperament and Development (New York: Brunner/Mazel, 1977). In their longitudinal studies, which date from the early 1960s, they observed children beginning in their second and third months of life. I was struck by their findings of “Nine Categories of Temperament,” which are recognizable in infants and very young children! Oversimplifying, I took each of these temperaments when strongly present as a predominant way of organizing attention, and then matched these with the nine Enneagram patterns of attention or habits of mind. Without much stretch, the correspondence is remarkable. 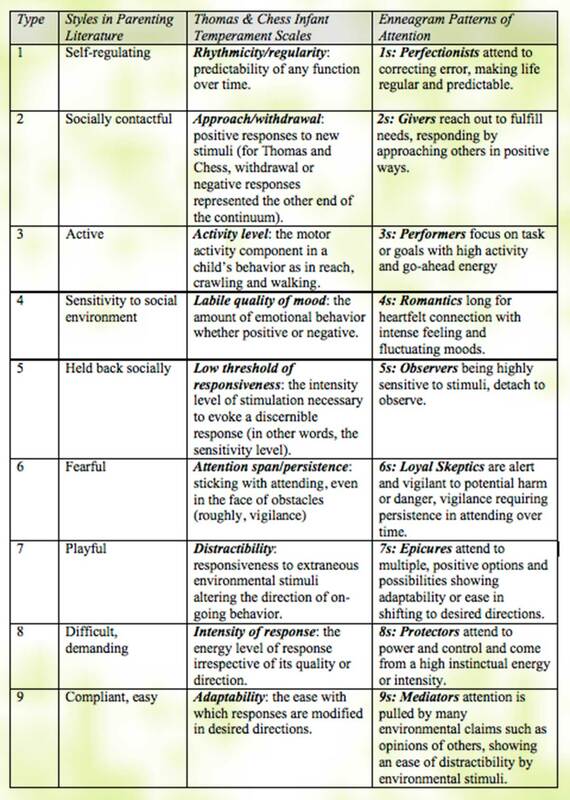 Here (in table format) is a synopsis of how children of the nine temperaments correspond to the fundamental attentional styles on the Enneagram. In addition I added temperament styles from the parenting literature. Rhythmicity/regularity: predictability of any function over time. Type 1s: Perfectionists attend to correcting error, making life regular and predictable. Approach/withdrawal: positive responses to new stimuli (for Thomas and Chess, withdrawal or negative responses represented the other end of the continuum). Type 2s: Givers reach out to fulfill needs, responding by approaching others in positive ways. Activity level: the motor activity component in a child’s behavior as in reach, crawling and walking. Labile quality of mood: the amount of emotional behavior whether positive or negative. Type 4s: Romantics long for heartfelt connection with intense feeling and fluctuating moods. Low threshold of responsiveness: the intensity level of stimulation necessary to evoke a discernible response (in other words, the sensitivity level). Type 5s: Observers being highly sensitive to stimuli, detach to observe. Type 6s: Loyal Skeptics are alert and vigilant to potential harm or danger, vigilance requiring persistence in attending over time. Distractibility: responsiveness to extraneous environmental stimuli altering the direction of on-going behavior. Type 7s: Epicures attend to multiple, positive options and possibilities showing adaptability or ease in shifting to desired directions. Intensity of response: the energy level of response irrespective of its quality or direction. Type 8s: Protectors attend to power and control and come from a high instinctual energy or intensity. Adaptability: the ease with which responses are modified in desired directions. Type 9s: Mediators attention is pulled by many environmental claims such as opinions of others, showing an ease of distractibility by environmental stimuli. Of course, we all have all of these ways of attending, but habitually our attention is organized in a specific pattern. Thomas and Chess actually factored the nine categories of temperament (attention) into three clusters of behavior for which they are known: the Difficult Child, the Easy Child, and the Slow-To-Warm-Up Child. None of these temperaments are meant to be more or less positive or negative than any other, just different. In fact, Thomas and Chess said, “In no case did a given pattern of temperament, as such, result in behavioral disturbance.” What is remarkable is that behavioral observations in very young children could discern nine ways of organizing the world or nine dominant temperaments with 90 percent reliability! Furthermore, Thomas and Chess’s focus was not in developing a typology, but in following child development. The nine temperaments constitute an “incidental” finding. And, as far as I know, Thomas and Chess performed their studies without the benefit of any Enneagram knowledge. This kind of independent work supports the validity of the Enneagram. What then is the contribution of environment to type? There are mountains of data supporting parental and environmental influences on children’s level of function, health, and well-being. Our level of development is strongly related to maternal and paternal warmth, responsiveness and flexibility. Without contact and emotional nurturance, development in infants at all levels can be severely delayed and/or damaged. Children’s self-esteem correlates strongly with parents’ ability to sustain appropriate boundaries that enlarge as children grow. Just read Dr. Dan Siegel’s Parenting from the Inside Out (New York: Jeremy P. Tarcher/Putnam, 2003) to experience the importance of parenting in secure or healthy attachment and the value in the findings of attachment theory per se. Moreover, the interaction between the brain and environment profoundly affects the developing brain and the embedded patterns of flow and information that we call the mind. See Dr Dan Siegel’s The Developing Mind (New York: Guilford Press, 1999). So it can be said that both nature and nurture contribute to our type, but that nurture is more related to our level of development or health. Moreover, the infant’s experience in the intrauterine environment greatly influences development. For example, the neurotransmitter (chemical) effects of the mother and her life likely have enormous effect on the development of the fetus. At the very least there is always an interactive effect going on between nature and nurture. For parents and educators all this means that one size does not fit all and that, in Enneagram terms, there are nine different styles of learning. Thus, caregivers need to appreciate and respect differences in children by showing flexibility and adaptability. On an informal basis, we all need to learn how to work with children’s type-dependent differences, their attentional styles and corresponding energies. And we need to recognize that environmental influences begin at conception, not at birth. However, since children manifest temperament differences so early in childhood literally at birth and in the Thomas and Chess work from 3-18 months, what does all this have to say about typing children? Can we not know the child’s Enneagram type very early and act accordingly? While the answer often is yes we can type a child early, the danger is not only in misdiagnosis, but also in the naturally occurring non-conscious application of stereotyping according to the parent’s (care givers) stereotype of type. In my view, this is the hazard in typing young children. Hence, even if we could determine type with impunity early (and we can’t), this would not be a good practice. As stated above, flexibility and adaptability on the part of caregivers are key. Typing per se best be deferred until children have abstract thinking in place around age 11-14, about middle school age. Hence, when I conducted the first children’s panel at the International Enneagram Association annual meeting, I insisted that the participants be in the 11-14 age range. And they all were. Lastly, it is likely also true that type influences which aspect of the essential self will be most affected. If, for example, a child is born with or develops heightened attention span and alertness/vigilance to danger early in life, this child may be more vulnerable to having the original faith in self and others recede into the background with the concurrent development of fear and mistrust. Acknowledgments: I wish to thank Laura Baker, Denise Daniels, Carolyn Dawn, Jack Killen, Dan Siegel, and all our students in the Narrative Tradition of the types speaking for themselves for their contribution to this work and to my understandings of childhood origins. – DD.